Toaster ovens have evolved from basic dorm and office accessories into countertop appliances just as capable of baking pie as a full-size oven. The toaster oven does it without heating up the kitchen or using much electricity. 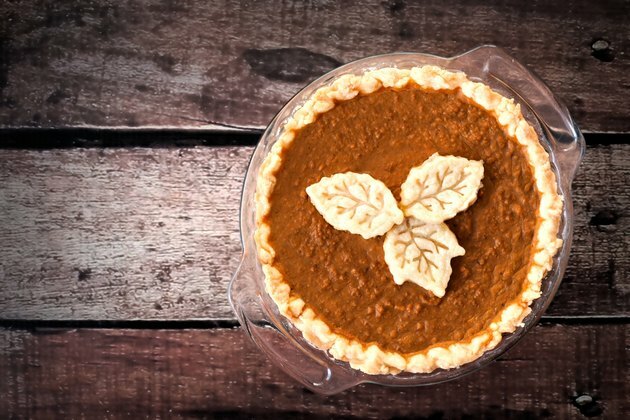 Use the oven for both sweet and savory pies. They are ideal for recipes with summertime's fresh fruit. Vegetable-filled pot pies also work well for quick and healthy meal options. Measure the oven's interior to find out what size pie pan will fit inside, leaving 1 inch around the pie plate. Use that size pan to bake the pie, or mini pie pans for individual servings. Prepare the filling according to your favorite recipe. Preheat the oven to 350 degrees Fahrenheit. Pour the filling into the pie crust, and place aluminum foil strips around the edges of the pie crust. Set the timer. Bake a full-size, 8- or 9-inch pie for 45 to 50 minutes, less for individual pies according to the recipe instructions. Remove pie from oven when done, using oven mitts as the entire oven, including the outside metal casing, will be very hot. Cool pie on wire rack. Sprinkle coarse sugar on top of fruit pies for a sparkle effect and crunch. A mixture of one egg white and 2 tsp. water can be brushed on the top crust for a shiny glaze. Since the pie is close to the top heating element, cover the pie with aluminum foil during the last 15 minutes of baking to prevent a scorched top.